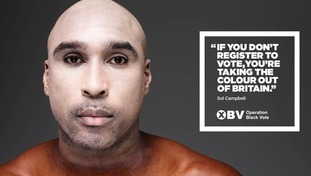 A hard-hitting new campaign encouraging minorities to register to vote before it's too late has been launched with the help of some British stars. Homeland actor David Harewood, musician Tinie Tempah, ex-footballer Sol Campbell and Paralympic medallist-come-TV presenter Ade Adepitan have been photographed for Operation Black Vote. The campaign features four posters with photographs taken by leading photographer Rankin and an online 60-second advert starring Harewood, made by ad agency Saatchi and Saatchi. Launching the campaign, Harewood said voting was the only way to change institutions such as Westminster and make them more representative of a multicultural Britain. What it brilliantly illustrates is that if you don't register to vote, you are quite literally taking all the vibrancy we have in our community off the table. If you don't register to vote, politicians don't really care about you, politicians aren't really caring about what you have to say, what you have to do, anything. "The only way they talk to you is if you register to vote. That is when you become an important part of the electorate," Harewood added.